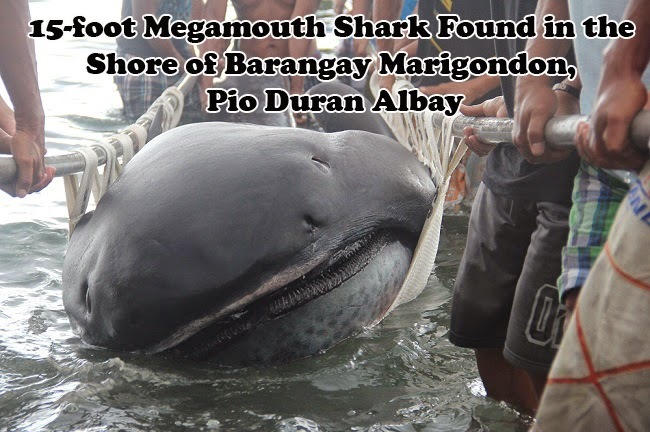 A carcass of a rare 15-foot megamouth shark had been discovered by a group of fishermen in the shores of Barangay Marigondon, Pio Duran in Albay on January 28, 2015. The dead megamouth is only the 63rd sighting recorded in the history after its species had been established. The head of the Bureau of Fisheries and Aquatic Resources-Regional Emergency Stranding Response Team, Nonie Enolva, had shared to Inquirer that the shark was found at around 6am. It sustained a number of wounds and its tail was missing. The actual cause of death is still yet to be established but there could be a possibility that it was cause by the fishing nets. There is also a possibility that the endangered species had eaten some kind of poisonous organisms. Enolva further shared that the dead 15-foot megamouth shark is planned to be preserved through taxidermy and displayed in Albay Park and Wildlife. Megamouth shraks are rare and were documented to eat planktons and jellyfish. As recorded by Florida Museum of Natural History, the first Megamouth Shark was captured in 1976. Because of its discovery, a new specie, genus and family of shark had been created. They live in the upperpart of the sea area and with the 6th captured megamouth which they tagged and followed for two days, scientists gains understanding of its habitat. The said megamouth had stayed at around 15m in sea depth at night went down to 150 meters when dawn came. With its name, people have the idea on what megamouth sharks look like. They actually have 50 rows of tiny sharp teeth on each jaw. As reported the maximum size of megamouth is 17 feet or around 550cm. Though with its sheer size, they have calcified cartilaginous skeleton and loose skin. With the recent sighting, Philippines is considered the second country to have highest number of megamouth sightings next to Japan.